Duke Forest staff completing installation of interpretive signage. In April 2017, we completed the restoration and enhancement of the Shepherd Nature Trail. Details about this project are provided below. 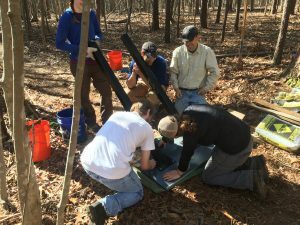 The Duke Forest recently received a grant from the Durham County Open Space and Trails Commission to support a project to overhaul its worn-out, outdated, but one and only interpretive trail. The trail is located off of Highway 751 in the Durham Division of the Duke Forest. It is known as the Shepherd Nature Trail and was developed by boy scouts and then added to by students over the past 20 years. 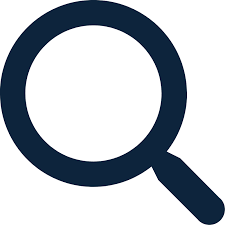 It is intended to be a self-guided nature trail that demonstrates a continuum of systems typical of the North Carolina Piedmont and teaches visitors about tree species, forest processes, past inhabitants, and current research. Unfortunately, both signage and sections of the trail have fallen into disrepair. 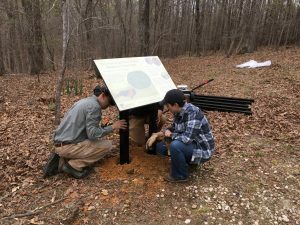 Duke Forest staff and volunteers installing interpretive signage. We hope the restoration and enhancement of the Shepherd Nature Trail will provide an outdoor forum for a wide range of users to learn about and discuss the natural environment of the NC Piedmont and sustainable forest management. This project will improve the visibility, accessibility, and educational value of the Shepherd Nature Trail through overhauling signage, improving trail conditions, and investing in infrastructure upgrades. Examples include removing dense, difficult to read signage and replacing it with bright, descriptive, and easy to read educational ‘snapshots’; replacing fence railings and bridge treads to improve safety and accessibility; rerouting trail sections to prevent erosion, improve accessibility, and minimize tripping hazards; and building additional picnic tables near the trailhead to accommodate more users. Small but heavy machinery working on the Shepherd Nature Trail. 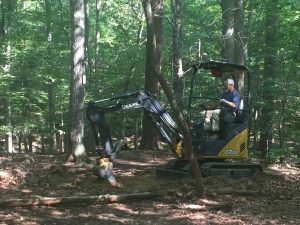 This project is funded through the Duke Forest Improvement Fund and by the Durham County Matching Grants Program for Recreation and Open Space Projects.